Understanding the factors affecting variation in phenology within a species is important as flowering time constitutes one of the major barriers to gene flow. 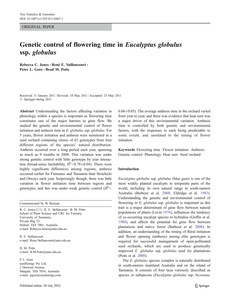 We studied the genetic and environmental control of flower initiation and anthesis time in E. globulus ssp. globulus. For 5 years, flower initiation and anthesis were monitored in a seed orchard containing clones of 63 genotypes from four different regions of the species’ natural distribution. Anthesis occurred over a long period each year, spanning as much as 9 months in 2008. This variation was under strong genetic control with little genotype by year interaction (broad-sense heritability, H2=0.78±0.04). There were highly significant differences among regions; anthesis occurred earlier for Furneaux and Tasmania than Strzelecki and Otways each year. Surprisingly though, there was little variation in flower initiation time between regions and genotypes, and this was under weak genetic control (H2= 0.06±0.05). The average anthesis time in the orchard varied from year to year, and there was evidence that heat sum was a major driver of this environmental variation. Anthesis time is controlled by both genetic and environmental factors, with the responses to each being predictable to some extent, and unrelated to the timing of flower initiation.